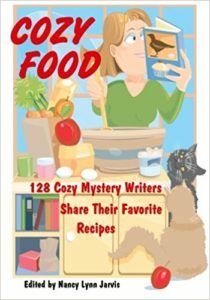 What happens when 128 cozy mystery writers get together to do a cookbook? You get more than 220 recipes that are as varied and interesting as an amateur sleuth’s day job. Regional recipes come from every part of the United States and England — a couple find their way from Australia and Italy, too — and from diverse times. There are recipes from people looking to keep gluten out of their lives, eat vegetarian, or make a treat or two for their furry four-legged friends. And yes, there are recipes that appeal to the sweet tooth, lots of them, in fact. There’s no mystery about what happens when cozy writers get together. They bring the wit, inventiveness, and adventure found in their books right along with their recipes. The recipes are introduced by their authors and linked to the writer bios in the back of the book. You can look up your favorite cozy writer and see which recipes are their favorites; they’ll tell you what the recipe means to them. Or you can enjoy a dish and then link to the recipe’s author’s biography and books. Either way you enjoy the cookbook, you’re sure to find great new recipes to make and terrific new cozy authors to read.